Home / Resources / How Can I Get Onto an Installation to Offer a Workshop or Training? How Can I Get Onto an Installation to Offer a Workshop or Training? Step by Step Guide from finding a point of Contact to Getting in through the Gate! You will need a military-connected professional to act as the point of contact for your event. Best practice is to begin contact at least 8 weeks before the potential date for the event. Be prepared to give a brief introduction about your parent center, the services you provide, and your role. Some military-connected professionals may not be familiar with Parent Centers. 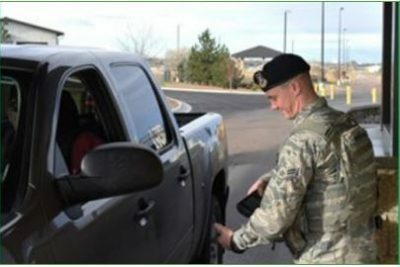 Present yourself and your Parent Center as potential partners that can offer civilian services and resources that complement what their programs do. “Will I need access to the installation, or is there an off-installation site we can use?” [Potential sites may include community centers in off-installation housing complexes, or other military offices that do not require installation access]. If you are planning to drive your car onto the installation, make sure that you have a current vehicle registration and proof of insurance. If you will be driving a rental car, you may provide a copy of your rental agreement. You may need to fill out a form to request access, which must be filed well in advance of your visit and processed by installation security. This is one reason to allow ample lead time for your event. We’re here to answer any questions you have about procedures, programs, and staff on any installation. Just give us a call at 1-800-572-7368, or email us at thebranch@wapave.org! What Does a Parent Center Do?